We followed the cellulose structure formation induced by water diffusion into Lyocell dopes based on both N-Methylmorpholine N-oxide (NMMO) and 1,5-diazabicyclo[4.3.0]non-5-ene acetate ([DBNH][OAc], by using scanning simultaneous small- and wide-angle scattering (SAXS-WAXS) experiment along the diffusion gradient. The water content at each point was estimated from the wide-angle scattering profile, giving a binary diffusion constant of the order of 5 × 10−10 m2/sec. In the case of the cellulose solution in NMMO monohydrate, diffraction peaks corresponding to cellulose II appeared concomitantly with the increase in small angle scattering features indicative of nanofibril formation. In the cellulose solution in the ionic liquid, an increase in small angle scattering intensity with the progression of water content appeared at scattering vector q = 0.015 Å−1 corresponding to a correlation length of about 40 nm, indicative of nanometric spinodal decomposition preceding the coagulation process, though no crystalline peak appeared in the wide-angle scattering. A correction to this article is available online at https://doi.org/10.1007/s10570-019-02410-3. Structure formation during the processing from highly concentrated solution dope is a crucial step in controlling the final material properties in solution processing, including fiber spinning, membrane generation or fabrication of other functional materials. One of the reasons for the success of the viscose process for the manufacture of regenerated cellulose fibers, despite its environmental concerns, is its ability to adjust various fiber properties and supramolecular structures by modifying the operational conditions. For other potential solvent systems, such as environmentally friendly direct solvents that can be used in large quantity, the control of the structural formation is a key. However, little is known on the structure formation process at nanoscale. NMMO is a direct solvent used in the industrial production of cellulose fibers belonging to the lyocell fiber catergory, as does [DBNH][OAc], a new protic ionic liquid (PIL) with excellent cellulose dissolution and spinning properties (Sixta et al. 2015; Hummel et al. 2016). Both are miscible with water but lose their cellulose dissolution capacity with excess water. Thus water is used as non-solvent to regenerate cellulose. In the spinning process, the humidity in the air gap is known to be an important parameter (Mortimer and Peguy 1996), but its role remains hypothetical in the absence of experimental data on the structure modification. The regeneration of cellulose by a non-solvent, in this case water, is a complex process involving diffusion of non-solvent into the dope, diffusion of different solvent molecules into the coagulation bath and the structure formation and swelling or contraction of the regenerating gel. Thus there is a huge difference in estimated diffusion coefficients depending on the experimental approach and the diffusion model employed. A critical review of the literature data is available in a recent report by Hedlund et al. (2017). The reported value of diffusion coefficient of water and NMMO in NMMO/cellulose dope measured by visual inspection of diffusion front (Biganska and Navard 2005), after correction of equation as pointed out by Hedlund et al. (multiplication by factor of 4), was 4.4 × 10−9 m2/s, which is higher than the self-diffusion coefficient of water at ambient conditions (2.57 × 10−9 m2/s). The self-diffusion of NMMO to the coagulation bath was estimated to be about one order of magnitude lower, and further decreasing in the presence of cellulose (Biganska and Navard 2005). By using NMR diffusometry, Laity et al. (2002) assessed the self-diffusion coefficient of NMMO and water molecules in NMMO/cellulose solution to be of the order of 4 × 10−12 m2/s, which increases to the order of 1.5 × 10−9 m2/s in the course of coagulation with water, while effective mutual diffusion during coagulation as estimated from composition change was 1.4 × 10−10 m2/s with the NMMO loss and water influx to be identical (Laity 2002). Similar NMR studies on ionic liquid systems show the diffusion coefficient of pure ionic liquid (1-ethyl-3-methyl-imidazolium acetate) to be 10−11 m2/s and this value can go down by two orders of magnitude in the presence of carbohydrates due to the association with hydroxyl groups (Ries et al. 2014). In the ionic liquid–water system, the diffusion constant of ionic liquid increases under the presence of water, while that of water is slowed down by the presence of an ionic liquid (Hall et al. 2012). The diffusion of solvents and non-solvents during the regeneration of cellulose depend also on the network structure of regenerating cellulose. Gavillon and Budtova (2007) measured decreased diffusion coefficients of NaOH and NMMO in the presence of coagulating cellulose that would indicate homogeneous gel formation where individual chains would interact with the solvent. On the other hand Hedlund et al. 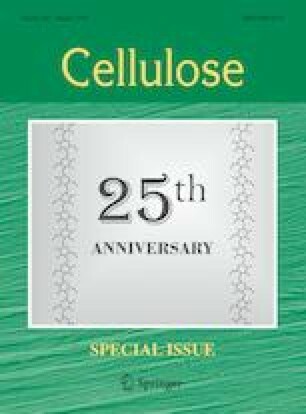 (2017) observed little effect of cellulose in [C2 min][OAc] system indicative of heterogeneous gel formation in which most of cellulose chains would be excluded from the solvent system. However, diffusion is also affected by many factors such as intermolecular interactions. The structure of coagulating cellulose, which can also depend on the cellulose concentration, cannot be directly determined from the diffusion data alone. X-ray scattering is a powerful tool to probe the spatial arrangement, from sub-nanometric to sub-micrometric length scale inside a sample. 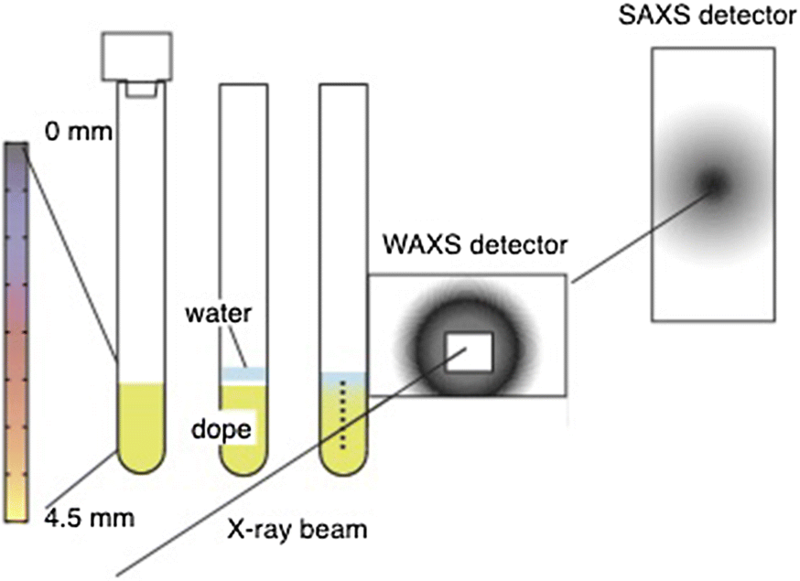 In this study, we measured simultaneous small- and wide-angle X-ray scattering on regenerating cellulose near water (coagulant) solution interface to follow the structural formation. Birch pre-hydrolyzed kraft pulp (PHK) with DP 1007, Mw = 274.3 kg mol−1, Mn = 68.2 kg mol−1 and PDI = 4 from Stora Enso Enocell Mill, Finland was used as a cellulose solute. 1,5-Diazabicyclo[4.3.0]non-5-ene (DBN) (99%, Fluorochem, UK) and glacial acetic acid (Merck, Germany) were used as received. [DBNH][OAc] ionic liquid was synthesized by slowly adding equimolar amounts of acetic acid to DBN under cooling (Michud et al. 2015). The cellulose solutions were prepared in a 200 ml vertical kneader rotating at 30 rpm, under a vacuum of 3–5 mbar. The temperature was regulated to 90 °C for the NMMO system and 80 °C for [DBNH][OAc] system. It took 90 min to prepare a 10 wt% cellulose solution. For the NMMO system, 0.15–0.28 g of propyl gallate was added to the dopes as stabilizer. The samples were put in a glass tube with an outer diameter of 3 mm and a wall thickness of 200 µm. The [DBNH][OAc] cellulose solution was viscoelastic at room temperature, and thus a hot solution was centrifuged at 3000 rpm for 1 min to fill in the bottom of the tube. The cellulose- NMMO dopes were solid at room temperature, and could be easily loaded into the tubes. where 2θ is the angle between the incident beam and the scattering direction. A series of X-ray scattering profiles of solvent–water mixtures measured at 80 °C for [DBNH][OAc] and 90 °C for NMMO monohydrate are presented in Fig. 2. The scattering of neat [DBNH][OAc] and NMMO monohydrate has maximum intensity at q = 1.4 and 1.2 Å−1 respectively whereas water scattering peaks at around 2 Å−1. With increasing water content, the scattering profile continuously changes and each mixture has a unique profile. The relation between water content and intensity at these peak positions are plotted in Fig. 2c, where a reasonable estimate of the water content can be obtained from the single intensity value. An Akima spline (Akima 1970) was used to relate the intensity to the water content. In the case of cellulose dope, the presence of cellulose would slightly modify the wide angle scattering, but this effect was neglected as a first approximation. To follow the coagulation process with contact to water, the sample was filled to approximately 5 mm from the bottom of the tube, mounted on the temperature controlled sample holder, and a water drop (ambient temperature) was inserted from the top to allow diffusion into the solution. The temperature was maintained at 80 °C for the [DBNH][OAc] system and 90 °C for the NMMO system. The sample was vertically scanned before and after addition of water and with regular interval to monitor the structural evolution. This prediction of concentration distribution is overlapped as solid line on the concentration evaluated from the scattering intensity. Here, in both cases, a mutual diffusion constant of 5 × 10−9 m2/s was used. Since the volume beneath the vertical reference position is held constant by the tube wall, the influx of water into the solution is equal to the solvent and cellulose outflux from vertical position 0. 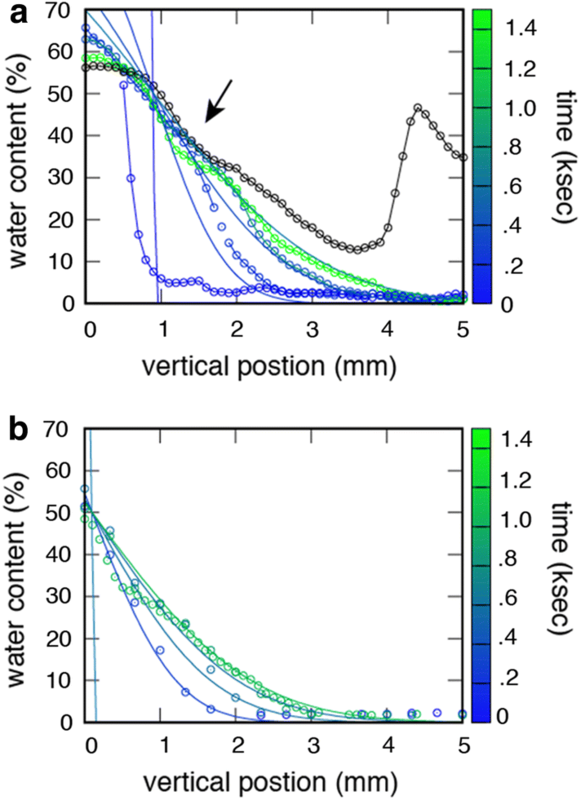 The self-diffusion coefficient of water at 80 °C is 6.25 × 10−9 m2/s (Yoshida et al. 2008) so the apparent diffusion coefficient is not far from the pure water, contrary to what was estimated from NMR diffusometry. In some places the water diffusion seems to be even faster (arrow in Fig. 3) which might be due to the presence of microcavities. 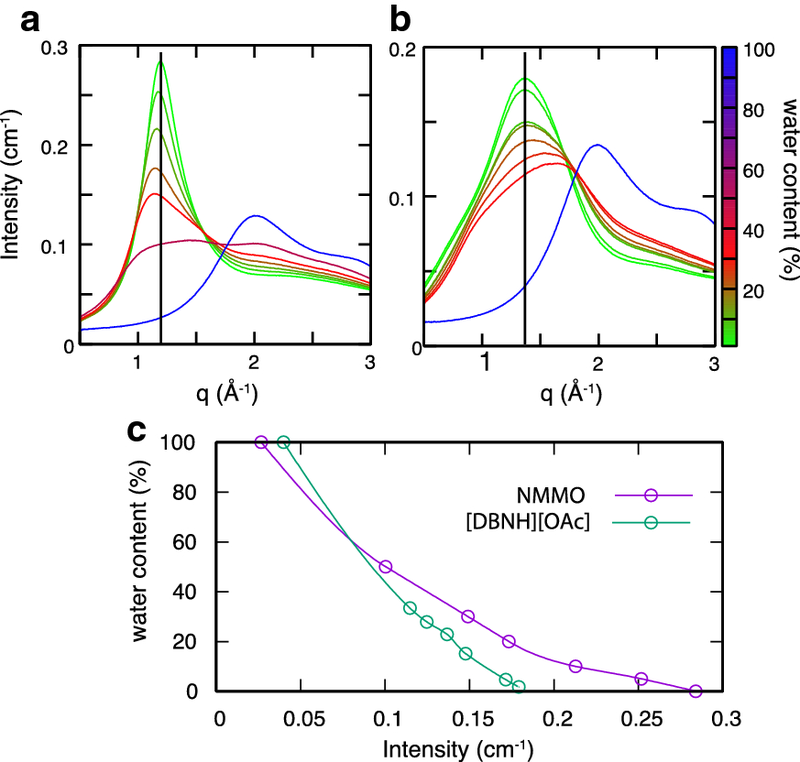 Before the addition of water, the small-angle scattering of cellulose solution in NMMO monohydrate at 90 °C followed a power law with an exponent of -3 below q = 0.08 Å−1, steeper than what would be expected for an extended polymer chain segments. This excess scattering intensity below q = 0.08 Å−1 indicates heterogeneity of the solution structure or density fluctuations at least at a nanometric length scale. In the wide-angle range, depending on the position of the beam, sharp crystalline peaks can be seen (Fig. 4a right). On the other hand the feature in the small angle region below q = 0.04 Å−1 is independent of position, and thus should not be related to the crystallization seen in the wide-angle scattering that is more heterogeneous and localized. One possibility would be micro cavities with irregular surfaces or polydisperse nanobubbles created during the crystallization of NMMO when the solution was cooled down. In theory, the high surface tension could lead to rapid Ostwald ripening. The kinetics of Ostwald ripening also depends on the volume fraction of bubbles and the solubility of the gas, which can be small. The intensity increase at low q can also be due to the aggregation of cellulose chains. In this case, it would be a loose association of cellulose chains as there is no sign of cellulose crystallinity in the wide-angle scattering. Some positions show a shoulder appearing at around q = 0.1 Å−1, which again does not correlate with crystalline peak intensity. For the moment we do not have any explanation for this feature. In the small-angle region, about 5 min after the addition of water (Fig. 4b), the scattering intensity in the q-range of 0.01–0.02 Å−1 increases at positions close to the water interface, up to vertical position of 2 mm, due to a coarse structuring (thick line in Fig. 4b). On the other hand, the intensity decreased in lower positions with diffusion of water. This decrease can be explained if the scattering of the dope comes from microcavities that are now filled with water. As a result, the electron density contrast between the cavity and the bulk is reduced. The first increase in intensity from the original profile can be seen between q = 0.03–0.1 Å−1 at a position 2 mm from the top, corresponding to about 10 wt% water content (not counting the hydration molecule of the monohydrate). The exact peak position of the new signal cannot be determined due to the uncertainty of the high scattering from the coarse structure that already present before addition of water. In the wide-angle range, the sharp diffraction disappears at water content of about 5% (vertical position = 2.5 mm), and a crystalline peak typical of polymer crystals starts to appear at the vertical position of 2 mm, corresponding to a water content of 10%, first at q = 1.4 Å−1 followed by another peak at q = 1.5 Å−1 further closer to the interface (vertical position = 1.8 mm, water content = 15%, drawn with thick line in Fig. 4b). These peaks corresponds to a d-spacings of 4.5 and 4.2 Å respectively which is close to the strongest reflections of cellulose II, 1 1 0 and 0 2 0 (d = 4.4 and 4.0 Å), and is probably due to the crystallization of cellulose essentially in the direction perpendicular to the pyranose plane, and not completely in form of cellulose II, as the peak positions are slightly different and 1–10 cannot be seen. The two peaks are also quite similar to Na-cellulose complex (Nishiyama et al. 2000), and might be due to a similar loose complex structure involving NMMO molecules. The very early stage of coagulation showing only one peak at d = 4.5 Å is also reported by Fink et al. (2001) in the never-dried fiber from the NMMO system. 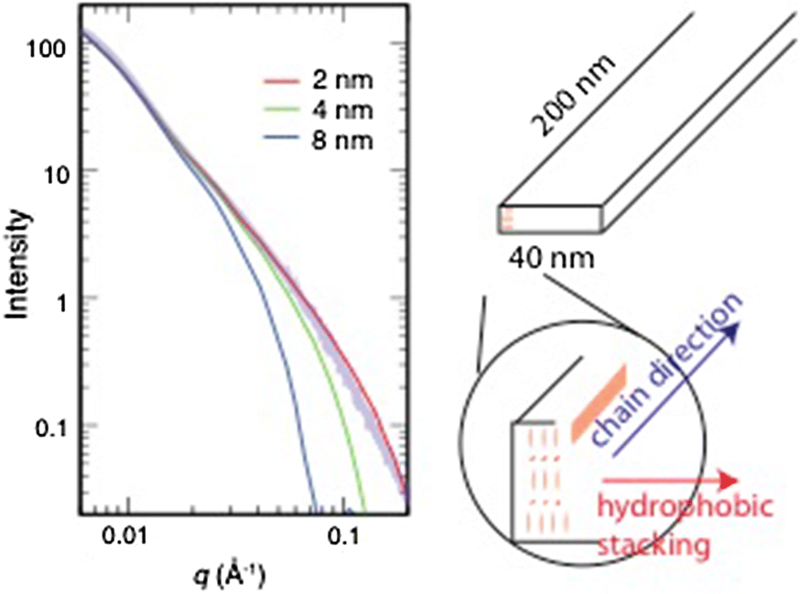 Under the applied conditions, the crystalline order grew perpendicular to the hydrophobic stacking, but to a smaller size than in the hydrophobic stacking direction. The scans performed 15 and 25 min after the introduction of water (Fig. 4c, d) record the course of water diffusion and the associated structure formation. In both cases, the change in small-angle scattering features coincided with the appearance of the first diffraction peak at q = 1.4 Å−1, indicating that the structuration is essentially due to crystallization, or stacking of chains in one direction occurring at relatively low additional water of 10%. Some aspects seem to be governed by timescale accessible in this experiment ~ minutes. For example, a small peak at 0.97 Å−1 corresponding to d = 6.5 Å first appears after 5 min in the zone where water content is 30–40%, but disappears from this zone in the later stages, reappearing in the zone closer to the water interface. The current data do not allow a clear molecular view of the structure formation, but the distance would be compatible with molecular distances in the plane parallel to pyranose plane. The slope of the small angle scattering between q = 0.1 and 0.2 Å−1 is close to − 4 and is compatible with the formation of nanometric crystalline fibrils that make clear boundaries between the solvent. Between q = 0.01 and 0.06 Å−1, the slope is close to − 2, typical of a flat object. The diffraction features suggested that the crystallization to be very directional, perpendicular to the pyranose plane, which agrees with the vision of a flat ribbon to be formed. For comparison, Fig. 5 shows a simulated scattering profile for a randomly oriented parallelepiped 200 nm long, 40 nm wide and 2 to 8 nm thick, which shows a general agreement with the scattering profile, especially when the thickness was 2 nm. A thickness of 2 nm could correspond to about three layers of cellulose sheets intercalating NMMO and water molecules. At q above 0.2 Å−1, the simulation deviates from the observation, as the coagulated object cannot be considered as homogeneous cuboid at this length scale giving rise to excess scattering in the real world. Of course this is not the only model that can explain the small small-angle scattering profile and it should be considered as one of the plausible models. 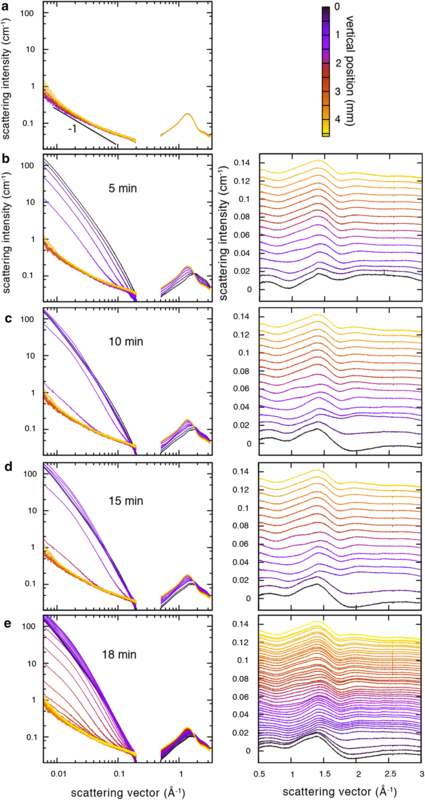 X-ray scattering profiles of 10% cellulose solution in [DBNH][OAc] at 80 °C is shown in Fig. 6a. Contrary to NMMO solution, there is no indication of a coarse structure or density fluctuation except for slight excess intensity at lowest q ~ 0.01 Å−1 in some parts of the sample. The intensity follows I ~ q−1 with a prefactor similar to the case of cellulose solution in NMMO monohydrate, typical of a rod-like scattering object. When water is added, the intensity drastically rises below q = 0.1 Å−1 forming concave upward profiles, even with the slightest change in the wide-angle scattering. Throughout the experiment no crystalline peak appeared in the wide-angle scattering. The first event of regeneration is the density fluctuation, probably induced by the spinodal decomposition. This is different from the case of regeneration from NMMO solution where elongated plate-like crystalline domain forms. 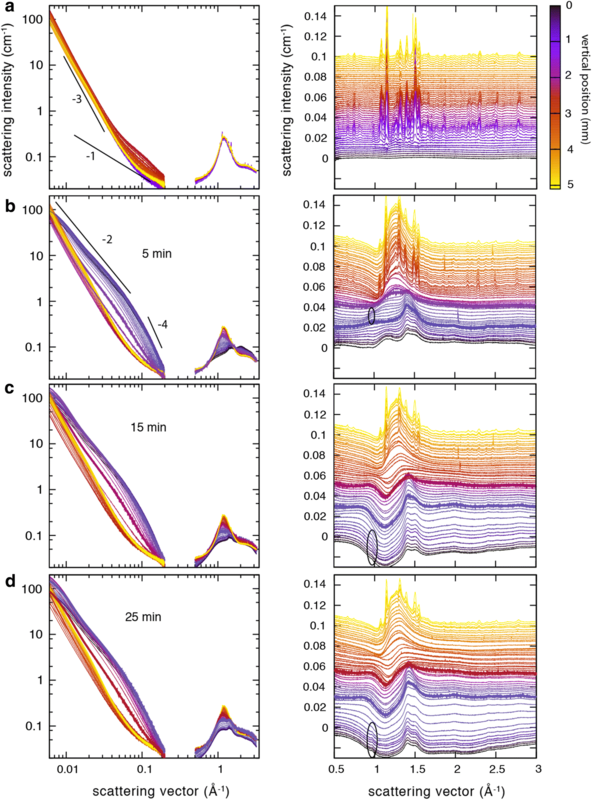 The regeneration event starts with an appearance of a small shoulder peak in the small angle region between 0.01 and 0.02 Å−1 corresponding to a density fluctuation with a periodicity of 30–60 nm. The increase in small angle intensity occurs at water content of about 5% and completes below 15% water content, the transition corresponding to a depth at about 500 µm as judged from the wide-angle scattering according to Fig. 2. The spun fibers from [DBNH][OAc] are known to be crystalline, similar to the NMMO-based Lyocell fibers (Sixta et al. 2015; Hauru et al. 2016). In this simple experiment, no extensional flow or shear that would force the alignment of cellulose chains exists. In the spinning process, such strain can facilitate the crystallization. Also, the water content at the interface was only 50%, and still the cations can be strongly bound to the cellulose chains impeding the crystallization. The crystallization in the process might be occurring during the washing stage where the solvent concentration is much lower. Indeed the particularity of the [DBNH][OAc] is the apparent slow diffusion from cellulose gel (Hauru et al. 2016) that might be due to strong affinity to cellulose. These points will be investigated in the future by analyzing further the washing stage, and the effect of different strain conditions on the sample during the regeneration. A simultaneous wide- and small-angle X-ray scattering allowed us to follow the water diffusion during regeneration, crystallization behavior and nano-structure formation of cellulose during the regeneration process. Unidirectional crystallization was the first step of coagulation in the NMMO dope/water regeneration, while no crystallization was observed in the regeneration process of [DBNH][OAc], up to a water content of approximately 50%. We thank Dr. Isabelle Morfin, Dr. Nathalie Boudet and Dr. Nils Blanc for assistance at the D2AM beamline, and ESRF for providing beamtimes. PA has received funding from Kone Foundation.